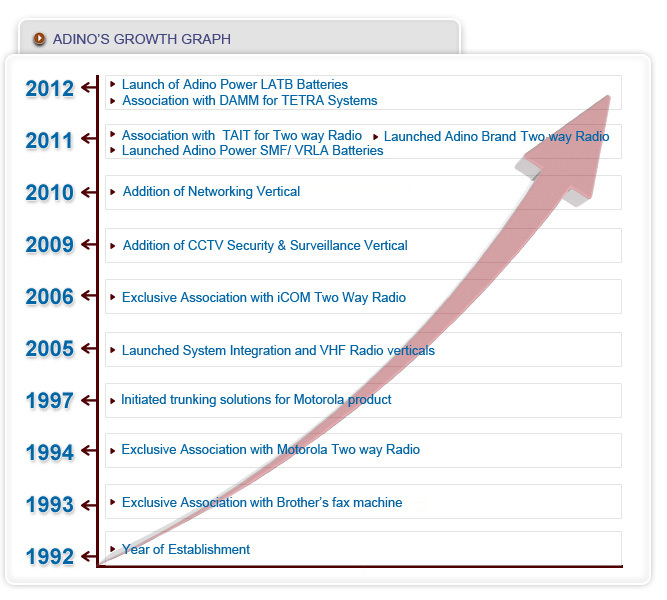 Adino Telecom Limited was incorporated in 1992, when India was going through a telecom revolution. Adino was launched by the senior promoters of ONIDA, to provide quality solutions for the increasing demand of telecommunication services in India. Since inception, the domain of the company has been telecommunication system integration and product sales. Currently Adino expertise business solutions comprises of System Integration, Storage Solutions, Networking Solutions, Two Way Radio Solutios & LED Lighting Solutions. Adino offers backhaul solutions & broadband wireless solutions with point-to-point, point-to-multipoint, any point-to-multipoint Ethernet wireless links. In addition to this, we offer system integration for CCTV surveillance, personal tracking and vehicle tracking solutions. We promote solutions, based on the WiMAX platform, citywide Wi-Fi, highway Wi-Fi and campus Wi-Fi. Adino also provides Value Added Services to support the growing demand of Information Technology and Telecom infrastructure services. Adino offers various power storage solutions including Sealed Maintenance Free (SMF), Lead Acid Tubular Batteries (LATB) & Silicon Batteries. These batteries are used in various applications such as Uninterrupted Power Supply (UPS) systems, inverters, renewable energy storage and telecom energy management systems. Adino offers networking products and services such as installation of L2, L3 manageable switches, un-manageable switches, 3G Routers, Modems and Cameras. Adino has launched professional two way radio communication equipment for public safety & health. We are associated with TAIT Communications for digital radios and systems and we have partnered with M/s Consort (DAMM) & HYT(R&S) to provide TETRA Solutions.